If you are used to eating hummus from a supermarket, and have never had the homemade variety, you are truly missing out! Homemade hummus has a much fresher taste and is highly adaptable. The best part is that it can be made in less then 15 minutes, which is probably less then the time it would take you to drive to a supermarket to buy it. The ingredients are fairly simple (minus the tahini, which can be found in either the foreign foods aisle or salad dressing/condiments aisle of your grocery store. A container usually lasts for multiple batches of hummus, so keep it in your fridge so that you can make hummus whenever you want!). The homemade pita requires a little more planning ahead, since it needs time to rise, but the dough is easy to make and each pita only cooks for several minutes. This is a healthy snack- way healthier than that cheese dip we posted and chips, and almost as delicious! In the bowl of a stand mixer, combine the yeast, honey and ½ cup of the water. Stir gently to blend. Whisk ¼ cup of the bread flour and ¼ cup of the whole wheat flour into the yeast mixture until smooth. Cover the bowl with plastic wrap and set aside until doubled in bulk and bubbly, about 45 minutes. Remove the plastic wrap and return the bowl to the mixer stand, fitted with the dough hook. Add in the remaining ¾ cup of warm water, 1¼ cups bread flour, 1¼ cups whole wheat flour, olive oil and salt (We needed to add an extra 1/3 cup of flour to make the dough workable. It should be very soft and somewhat spongy). Knead on low speed until the dough is smooth and elastic, about 8 minutes. Transfer the ball of dough to a lightly oiled bowl, turning once to coat, and let rise in a warm draft-free place, about 1 hour, until doubled in bulk. Place an oven rack in the middle position. Place a baking sheet or stone in the oven and preheat to 500˚ F.
Transfer 4 pitas, 1 at a time, onto the baking surface. Bake 2 minutes, until puffed and pale golden. Gently flip the pitas over using tongs and bake 1 minute more. Transfer to a cooling rack and let cool completely. Repeat with the remaining pitas. Store in an airtight container for up to 3 days. Transfer hummus to serving bowl, sprinkle reserved chickpeas and cilantro over surface, cover with plastic wrap and let stand until flavors meld, at least 30 minutes. 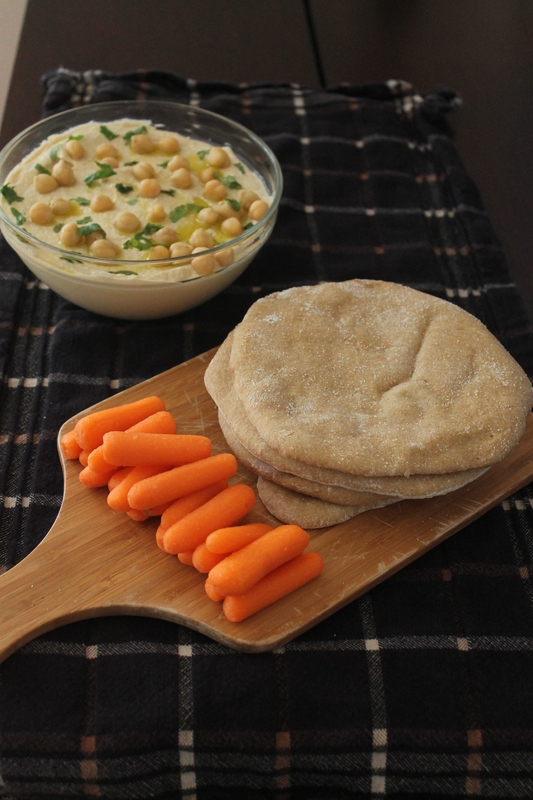 Drizzle with olive oil and serve with the pita bread and carrot sticks.